Okay, I admit, I had some preconceived notions before heading in to see P2. I didn’t think it would be good. And I must say, this film exceeded my expectations in how bad it actually was. I’m gonna be fair here, too, and spread the blame around evenly. The film is your classic holiday thriller. Pretty girl Angela (Rachel Nichols) is working late in a New York City high-rise on Christmas Eve. Do we know what she does? Nope. Does it matter? Not really. This is about as deep as her characterization goes. She’s running late to celebrate the evening with her family in Jersey, held up by work and the apology of a co-worker who got a little fresh with her at the firm’s annual holiday party. In the business, we call this foreshadowing. You can bet this little tid-bit is gonna come back and haunt someone. So Angela heads down in to the underground parking lot and wouldn’t you know it – her car won’t start. So a few false scares, some tense moments while waiting for a cab and a locked gate later, Angela gets chloroformed by the creepy parking lot attendant, Thomas (Wes Bentley). When she wakes up, she’s seated at a table, wearing a different outfit, in the parking attendant’s office, waiting for a microwaved Christmas feast. Oh yeah, she’s chained to the table. Well… after that things go from bad to worse. Angela escapes, gets recaptured, escapes again. The guy who was a little too forward at the office party? Thomas has him all trussed up and offers him to Angela as a Christmas gift. The rest of the 98 minutes are filled with a cat and mouse game between Angela and Thomas and the end is never really in question. In fact, nothing is ever really in question and that’s the biggest problem with this by the numbers effort from first time director Franck Khalfoun. Khalfoun doesn’t have the experience to handle what is essentially a two person show. When you have a limited number of characters to work with, you need to keep them in check so you can keep the tension taught, using the tools in your cinematic box to ratchet it up as you go. Kahlfoun doesn’t do that. Bentley is running amok as the psychopathic lovebird Thomas. He’s chewing so much scenery I’m surprised he had room for turkey. To be fair, he’s trying to build something, to create some kind of emotion for his character because the script, by Khalfoun, Alexandre Aja and Grégory Levasseur (yes, it took three people to write this) gives none of the actors anything to work with. The motivation, that Thomas has long standing crush on Angela, never really plays out. It never makes sense that the parking lot attendant would have access to the security cameras of the building or that he just happened to luck out that Angela’s car wouldn’t start (Did he sabotage it? We never find out). 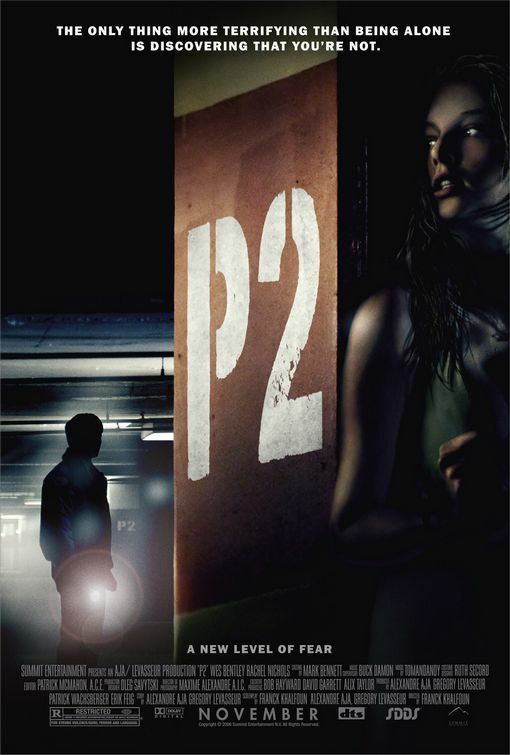 The only thing which comes close to saving P2 is that it is so laughably bad it almost becomes a parody of the genre. If it was slightly more over the top, this would be a funny, funny film. Unfortunately, it’s fairly obvious that when they use such graphic violence, over-the-top parody is not what the filmmakers had in mind. But then again, after spending time in the movie theatre watching P2 that I’ll never get back, I have to wonder what it is they did have in mind.